I decided to do these two quick reviews in one post since I got them both in last month’s BDJ Box. I feel like I’m posting too much, but at the same time, I want to get these posts out ASAP. 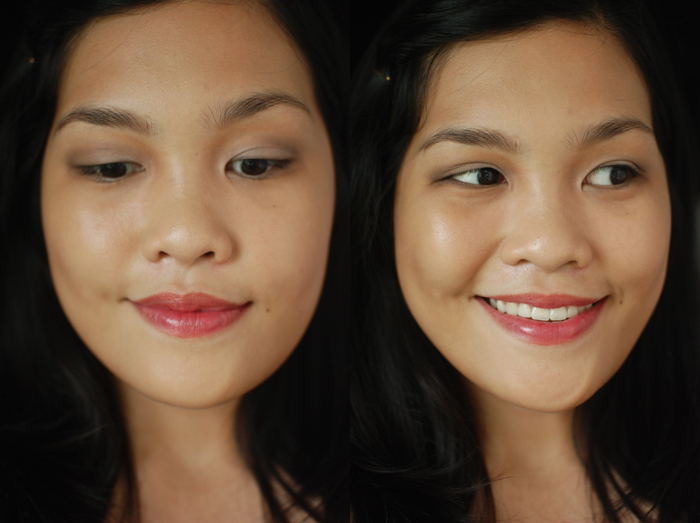 So, here: quick reviews on two out of the three makeup items included in that month’s box. I also have a review up on the too cool for school After School BB Foundation Lunchbox. The Revlon ColorBurst Lip Butter is one of my earliest makeup loves, especially the color Sugar Plum. 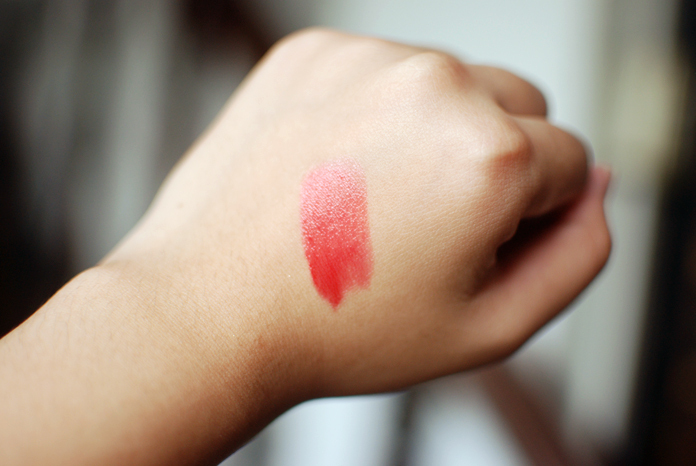 I was excited to try Wild Watermelon, which is one of Revlon’s new releases. I’ve been trying not to buy non-cruelty-free brands, so I’ve stayed away from Revlon for quite a while. DO YOU LIKE THE LIPSTICK CRAGS? Anyway, Wild Watermelon is a gorgeous, juicy red that really brings summer to mind! Doesn’t it make you want to bite into an ice-cold, juicy slice of watermelon? On the lips, it’s a lot more subtle. The pigmentation is sheer, but buildable, and reminds me of the effect of Sugar Plum, which looks deep in the tube but applies sheer. The color is free of shimmer, but has an ample amount of glossiness to it. 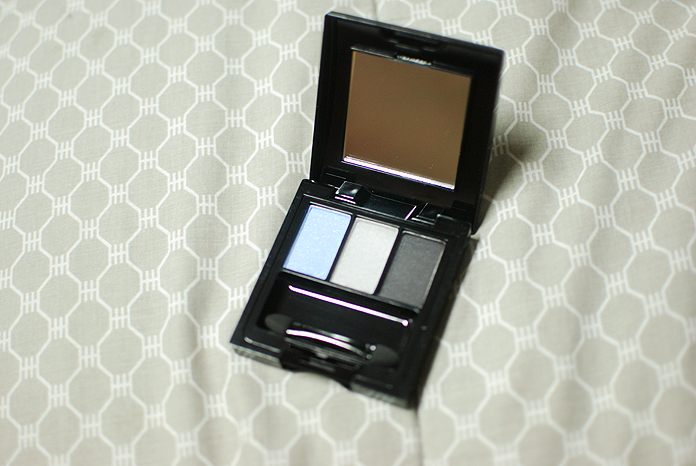 Next up we have the Enchanted Shimmer Eye Palette in After Midnight, which is an eyeshadow trio (!!!) that consists of a pale blue, a silver, and a black. 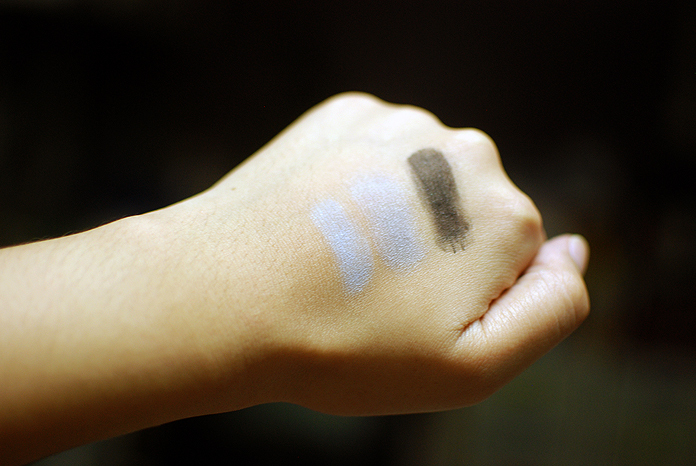 Here they are, swatched in order. There isn’t much contrast between the pale blue and the silver. They are nearly identical, with the silver being a bit lighter and having more of a purple tone to it, than a blue. The black is pigmented, though chalky. 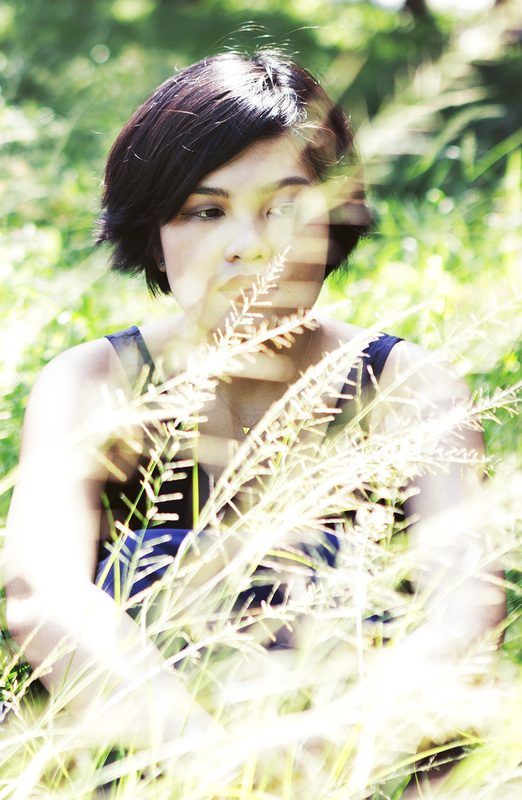 And here is a look I put together to test out the shadows. 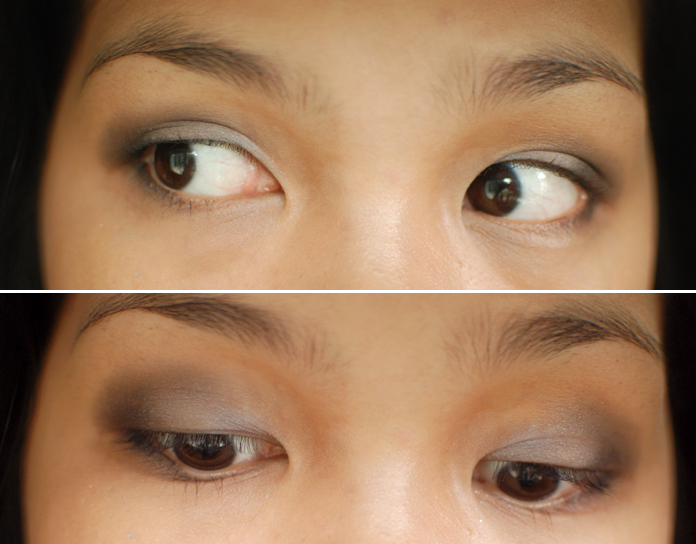 Blue in inner corner, silver in the center, blended out into the black, which I used to create a slight haze. The shadows were applied over the NYX Jumbo Pencil in Milk. The black outperforms everyone, while the silver needed a little bit of coaxing to show up. As you can see from the picture, the center part of my lid has the skin peeking through the silver. I wanted to just use my fingers, but I ended up using a blending brush on the outer corner for a more concentrated application, and a flat shader brush to smudge a bit of the black on part of the lower lash line. All in all, a decent palette for a beginner, especially one who wants to veer away from neutrals into the cool smoky eye zone. I personally don’t think I would really reach for it, since I tend to stay away from silvers and cool, pale blues. I think the pigmentation is not that great, but it’s also not terrible. * Both items were included in a subscription box I was sent for editorial consideration. I was not required or compensated to write this review. Aw, thanks for the encouragement! 🙂 and you’re welcome! Wow wow wow. Great lipstick colour. I didn’t liek the swatch of the eyeshadows very much (they look a little ashy and powdery) but they look very pretty on your eye. I agree, I was surprised, but I don’t think I’ll be keeping it! 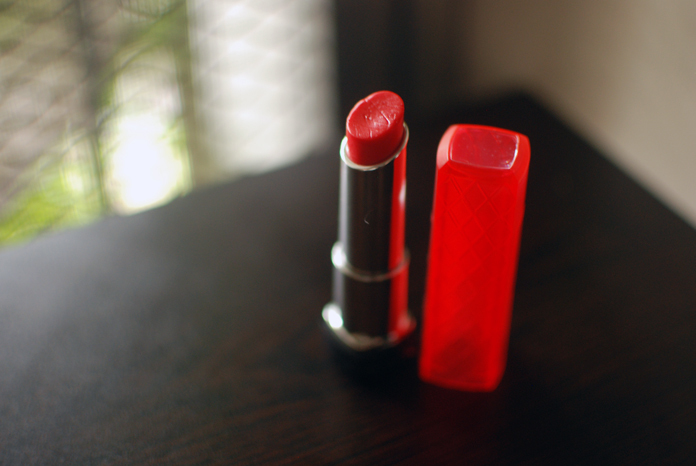 I got the Juicy Papaya color from the new Revlon Lip Butter releases. Maybe I should get a bolder color too. The formula is really great. In fairness, the black eye shadow is really pigmented. Lucky you for getting those products in those colors. My lip butter was an icky cotton candy pink (too Baby Spice) and the enchanted palette I got included a garrish sparkly pink. I did like all the Dove products that came with the box!